What is there to see Over the Pond? It may seem hard to believe that this small, cold, wet island once held dominion over three-quarters of the globe. The pomp and circumstance of previous centuries may have dwindled, yet the United Kingdom and its people remain fiercely proud, and the beauty and cultural wealth of the country would impress any visitor. Is the United Kingdom on your “to see” list? If not it should be. Just a short 6 to 7 hour flight over the pond, you can leave the USA and be having fish and chips for lunch in a downtown London pub in a matter of hours. The United Kingdom is made up of England, Scotland, Wales and Northern Ireland, as well as some smaller islands, and the geography sweeps from mountainous highlands, to green and pleasant rolling countryside and vibrant cities. The country is jam-packed with two thousand years of history, so despite its seemingly small size, a vacation in the UK of any length of time may feel short. The United Kingdom continues to rank as one of the top tourist destinations in the world, steadily attracting more than 32 million foreign visitors every year. This comparatively small island nation packs a touristic punch completely disproportionate to its size and the compact nature of the place, combined with excellent transport networks. It is an easy walking city for visitors and there is much to see. From the iconic Parliament, Big Ben Clock, the underground bunker used by Churchill during World War II, to Buckingham Palace and Windsor Castle, not to mention the mysterious Stonehendge, and first run shows in Picadilly Circus, there is just so much to see and do you may want to spend a week or more. For tourists, England remains the most popular country in the UK, and the vast majority of travellers visiting England spend time in London. Nine out of 10 of the United Kingdom’s top tourist attractions can be found in the capital. These include the National Gallery, St Paul’s Cathedral, Tower of London, Tate Modern, Natural History Museum, Epping Forest, Science Museum and, topping the list, the incomparable British Museum. The only Top 10 UK attraction that isn’t in London is Brighton Pier, the landmark feature of the UK’s most beloved seaside resort. Other much-visited tourist attractions outside of London include Cornwall’s Eden Project, Bath’s Roman Baths, Canterbury Cathedral, Warwick Castle, the Lake District’s Windermere Lake, and the iconic Stonehenge. The UK is blessed with ample natural beauty and is well suited to walking holidays (the Lake District, the Scottish Highlands and Wales are particularly beguiling for hikers), but when the infamous weather is not obliging happy hours can be spent soaking up culture in the world-famous museums, galleries, shops and theatres of the United Kingdom. Another big draw card are the grand estates and the old castles where you can tour and explore. London is the UK’s biggest city, a fantastic metropolis teeming with people of all races, creeds and walks of life. Here the old mixes with the new. Iconic sites contrast with modern sights and nightlife. The medieval cathedral cities, like York and Durham, reveal the rich history of a bygone age, while the industrial cities of Liverpool and Newcastle harbor an exciting nightlife. Edinburgh’s International Arts Festival draws talent from around the world to its ancient, picturesque streets. Travelling through the country reveals the United Kingdom’s diversity, from quiet country lanes and inland waterways to majestic stately homes and castles. Thatched cottages in the Cotswolds region paint a picture of perfect quaintness, where life appears to revolve around the village pub. The beauty of the Lake District remains almost untouched, and the dramatic, wild highlands of Scotland cannot fail to stir the soul. The heart of the British Empire and the United Kingdom has always been England. A tiny country in comparison to the United States or even France, it has nevertheless had a huge impact on the history of the world. All the regions of England are easily accessible from the invigorating capital city of London, famous for its history, culture and pageantry. In the north of England, lakes, mountains, castles and craggy coastlines create scenic splendour; a little further south the medieval city of York contrasts with lively Liverpool and Manchester, once famous as powerhouses of the Victorian industrial revolution and now known for their football teams, live music scenes and exhausting nightlife. Visitors travelling south will discover the English landscape, where a tranquil air blows through country lanes and Oxford that stands proudly above a university town that’s changed little over the centuries. South of London, the ‘Garden of England’ stretches out with bountiful farmlands to the coast, where visitors will find charming seaside resorts and fishing villages. From the Cotswolds to the craggy coast of Cornwall, the West Country offers an idyllic pastoral experience, with honey-coloured stone houses, charming thatched cottages and narrow roads winding through lush, rolling green fields. With its pomp and pageantry, today’s England is friendly, welcoming, fascinating and fun. Many people fail to visit the Channel Islands. To see it is to immerse yourself into what you think of when you envision this island nation.d The Channel Islands has been slow to change, since it is located away from the hip cities of Isles. English is the official language here, but there is no doubting that the Channel Islands have a distinctly French character. Even though they have been a dependency of the United Kingdom since the Norman Conquest in 1066, the Anglo-French cultural fusion found here is hardly surprising. After all, they are situated just off the northwest coast of France and about 90 miles (145km) south of England. The clutch of five islands is very small, their total area adding up to less than 80 square miles. The largest and most popular are Jersey and Guernsey. The other three are Herm, Sark and Alderney. The laid back beach and country lifestyle of the island group reflects a French influence. This is embodied in the cuisine most of all, particularly the seafood dishes, and jolly festivals such as Jersey’s annual ‘Battle of the Flowers’. For British holidaymakers, in particular, the islands provide a comfortable home away from home vacation in the sunniest and warmest corner of the British Isles. Apart from lovely, scenic beaches that are well-known by avid water sport enthusiasts, there is plenty of history and heritage to explore and discover in the main towns of St Helier (Jersey) and St Peter Port (Guernsey). Museums, historic buildings and traditional events commemorate a colorful past. Most notably, these features detail its more recent military and maritime history as the only part of the British Isles to be occupied by the Germans during World War II. Once the ancient kingdom of Ulster, Northern Ireland has been home to Gaelic kings, ancient Irish clans and seafaring Vikings. It is the land of St Patrick and the giant Finn McCool, and is steeped in the myths and legends of a mysterious and heroic past. Northern Ireland’s appeal encompasses beautiful scenery, historic forts and castles and a rich legacy of Celtic Christianity, as well as the Ulster people themselves who are welcoming and genuine, with an impetuous sense of humour. Another attraction is the small size of the country – its sights are all just a short, scenic drive from each other along mostly rural roads whose only traffic jams are caused by flocks of sheep and cattle crossings. To the southeast lie some of Ireland’s loveliest landscapes in the Kingdoms of Down, a region recognized worldwide as an Area of Outstanding Natural Beauty. County Down combines miles of spectacular coastline with fishing villages, seaside resorts, loughs, forests and the Mountains of Mourne. To the north is the dramatic Antrim coastline with its soaring cliffs, unblemished beaches and the magnificent, glacier-carved Glens of Antrim. Among the unusual rock formations glimpsed from the coastal road, none is stranger or more memorable than the famous Giant’s Causeway, the legendary tourist attraction that is fabled to be the highway built by giant Finn McCool, to bring his lady-love to Ulster from an island in the Hebrides. This UNESCO World Heritage Site is a mass of thousands of basalt columns tightly packed together to form stepping-stones leading from the foot of the cliffs into the sea. The gateway to the northwest is the historic walled city of Londonderry, or Derry, a city popularly home to poets and storytellers, which hosts plenty of live music and festivals, and is a centre of culture and creativity. Across the Sperrins is the city of Belfast, surrounded by hills and a wealth of industrial sites, such as old linen and corn mills that are a reminder of Northern Ireland’s industrial heritage. Belfast played a significant role in the Industrial Revolution and the development of its manufacturing businesses quickly turned the 17th-century village into a robust metropolis that today is home to a third of the country’s population and some wonderful architecture. With its green hills, rivers and lakes, mountains and spectacular coastline, Northern Ireland is the perfect setting for many outdoor activities, while in the towns and villages visitors will undoubtedly be invited to join in the craicor good fun, centred on a traditional Irish music session and a pint or two of the black stuff. For such a small country, Wales has a lot to offer. With dramatic mountains, spectacular seashores, tumbling rivers, fresh green valleys and Europe’s largest concentration of medieval fortresses, Wales is a real gem that is often overlooked by tourists. With a name that springs from the Anglo-Saxon term waleas, meaning ‘foreigner’, it is hardly surprising that the Welsh have a unique culture, language and heritage that distinguishes them from the English, Scots and Irish, though as part of the United Kingdom, Wales is still subject to its laws and regulations. Although best known for their unpronounceable place names, roaring men’s choirs, and fierce rugby teams, this is a friendly and hospitable nation. Though its largest city, Cardiff, has only about 350,000 residents, cities in Wales are home to interesting urban atmospheres that retain a certain historical quaintness while providing all the modern amenities one could ask for. Cardiff, especially, has in recent years emerged as one of the hippest cities in the UK. Resort towns like Llandudno, Swansea and Tenby provide elegant seaside escapes, and medieval fortifications such as Caernarfon and Conwy offer glimpses into Wales’ thousand-year-old history. Cruising is a great way to see the British Isles and there are so many ships and cruise lines that are available in all different prices. The beauty of a cruise of the British Isles is that all of the famous cities and ports are located along the Atlantic Ocean, and therefore very accessible by cruise ship. There are luxury lines like Viking Ocean with its new ships and popular 14 day itineraries. These cruises are sold out of 2017 and even in 2018 space is highly limited. A great time to go in mid summer when the weather is bright, sunny and warm. Anytime is a great time to visit the British Isles, just take some jackets and dress in layers. It is not uncommon for the weather to be cool and misty in the morning and then sunny and warm in the afternoon. But this weather seems to be popular among the flowers. Whenever you visit the British Isles, flowers abound. From bright-colored marigolds, to the vast stretches of roses in the parks, you will always be surrounded by flowers, particularly, in many of the London Parks. A cruise of the British Isles is very popular, so book early. Norwegian Cruise Lines, Princess Cruises, Celebrity Cruises and others all have wonderful itineraries that span from 10 days to two weeks. And the British Isles is a great starting point for a trans Atlantic from England all the way over to the East Coast of the USA. 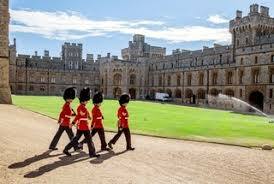 A must see while you are in London is to take a tour of Windsor Castle. It is a fascinating look back into history and many of the major Kings and Queens are buried there. English is the official language, though visitors will be astonished by the variety of regional accents. If a visa is not required, travellers should hold a return or onward ticket, or proof of funds for the duration of stay. Passports must be valid for the period of intended stay in the UK; nationals of the EU require a passport valid on arrival. It is highly recommended that passports have at least six months validity remaining after your intended date of departure from your travel destination. Immigration officials often apply different rules to those stated by travel agents and official sources. The currency is the British Pound (GBP), which is divided into 100 pence. ATMs are available in almost all towns and Visa, MasterCard and American Express are widely accepted; visitors with other cards should check with their credit card companies in advance. Foreign currency can be exchanged at bureaux de change and large hotels, however better exchange rates are likely to be found at banks. The electrical current in the UK is 230 volts, 50Hz. Flat three-pin plugs are standard. The peak tourist season in the UK is summer, between June and August, but it is pleasant to visit any time between April and October. The winters are cold and sometimes snowy, but travelling out of season is cheaper and the winter months can be cozy and exciting, particularly over the festive season. England and Scotland are on our bucket list, after Italy. We did a cruise around South America in j2016 and loved it. Think, though, a land journey is our preferred method for these countries. About half of our clients prefer the land tours and we book many in all price ranges — of which there are many that get you to see so many wonderful sites inlcluding exclusive tours of Windsor Castle, Stonehenge, Buckingham Palace, and more. Edinburg is wonderful and not to be missed. Exclusive shopping trips and much more. During peak season you do not want to be out in the hot sun getting tickets. So with a land tour that is all included. The nice thing about a British isles cruise is that you get to go over to the outlaying islands that are always missed on a land tour plus some include a hop skip over to Iceland. But most of the tourist sites are clearly along the water since that is where people lived for many centuries and even London is accessible via Cruse Ship! I am doing the Viking Ocean British Isles Cruise around all of the Islands next summer, 14 days. Viking Includes all of the excursions which can add up to a tidy sum. Happy travels.